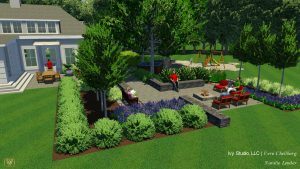 Here at IVY STUDIO, a Massachusetts based design and build firm specializing in outdoor environment expansions, we are redefining traditional methodology. We have a simplified three phase process where we orchestrate your outdoor project from concept through completion. Here we provide a detailed analysis of the client’s needs, style preferences, site analysis and budget considerations. Here our design professional works in concert with the client resulting in a comprehensive set of three dimensional designs with detailed renderings, expanded ideas generated and plan details including material choice option exploration. Here we invest our time-loads of it actually-ensuring the integrity of the design through implementation with regular site visits and constant contact with client. We sweat the details and the client can have peace of mind that their project is being effectively managed. Contact us at 781-591-0300 or vern@ivystudioMA.com to learn firsthand how we can compose your outdoor masterpiece in three movements.